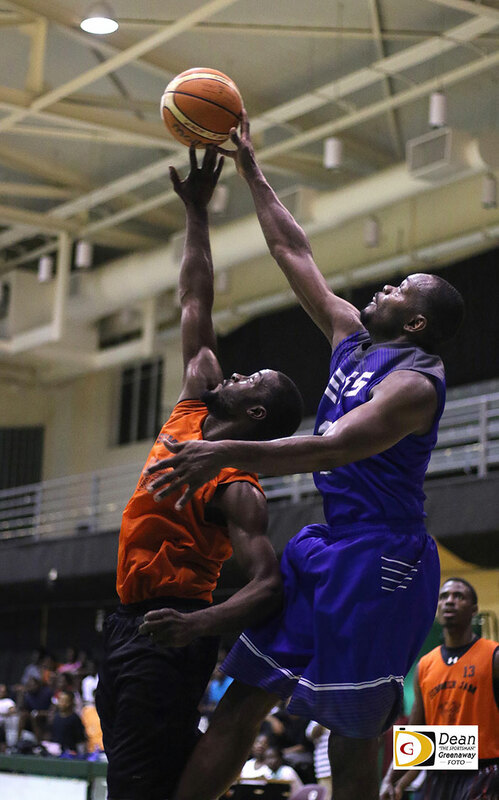 There are no unbeaten teams in the BVI Basketball Federation’s Senior Division, after Mega Guns crashed Friday night’s scheduled showdown between unbeaten Legs and the Virgin Gorda Mystics. Fans were granted free admission to the Legs versus Mystics matchup, after their July 9 game was called off, because there were no available referees to call the game. However, then first thing that the Mega Guns did, was to use Ray Victor’s 22 points, 11 rebounds and 11 assists triple double as the foundation for their 113-104 victory over the Mystics on Wednesday night, handing them their first loss. The Mystics rebounded from that stunning loss with a convincing 102-83 triumph, to knock Legs from the ranks of the unbeaten. Legs used a 7-1 run to start the fourth quarter, cutting a 13 points lead to 77-71, but that’s as close as they would get as the Mystics’ Killven Solomon scored 13 of his game high 25 points in the fourth quarter. Stephon Caul dropped in seven of his 25 in the period and so did Kimron Telemaque, scoring seven of his 16, helping the Mystics to put the game away. Legs’ Jasin Rhymer Jr., hit 3-pointers in the first quarter, where he scored 20 of his 25 points. Jason Edwin who had a scoreless first half, dropped in 15 of his 21 points in the third quarter. Legs’ coach Ronnie “Gola” Norman, said the game wasn’t on his mind like it was for the scheduled matchup last week. “To be honest, I didn’t expect to lose, not to a team that only came with six men,” he said. Then on Sunday, Mega Guns pulled out a thrilling 99-98 triumph over Legs, handing them their second loss in as many games. Halstead Chiverton paved the way with a game high 34 points. Douron Phillips followed up with a 21 points 15 rebounds double double and Tavon Phillips poured in 16 points and pulled 17 boards. Franklyn Penn Jr., was the Legs top scorer with 31 points. Edwin finished with 23 and Rhymer Jr., tossed in another 18. Following that game, Go Hard toppled the Mystics, 94-86, behind D’Moi Hodge’s 33 points and 15 rebounds. Caul led the Mystics with 18. Ryan Alfred had 23 points in leading the Latinos to their second victory of the season, 84-73 over the East Rockers, who were led by Leslie Smith’s 19 points. Jr. East Rockers toppled the Starz, 85-57 and the Bulldogs used Tamara Phillip’s 15 points and 14 rebounds game to turn back the BVI U16 Women’s team, 62-44. Shania Liburd’s 11 and Keithrece Smith’s 10 points, were the top scorers for the U16 squad.